1) Worksheets (no prep): Print this set, and put it in students folders. Each student can have his/her own booklet. This format is great for whole class lessons. It can also be used for independent or partner activities and homework. 2) Digital: Use the file “MathWarmUps_Paperless”. Share the file with your students’ devices and have them read the pages in any PDF reader app. This format is best if you have a 1:1 classroom and want to save paper. It can also be used to display on an interactive board for a whole class lesson. 3) Hands-on game: Print the pages, and cut them into strips. Punch a hole on one side, and keep the strips on rings. This format is best with small groups, centers, or for early finishers. If you want to save paper/cardstock, change your printer settings to print two pages per sheet. Here's a tip: Students can practice this independently during morning tubs or you can lead the class. When leading, call out an animal (or picture) and students will read the line that you have selected. This will keep them on their toes and will avoid kids memorizing the pages after several readings. You can even use these pages as ASSESSMENTS! Here's how: Put each page in a plastic protector in order to keep them nice and clean when students use them. Photocopy the page that you are using so that you have one per student. Hand the student your teacher copy (in the plastic protector) and fill in the student’s copy as he/she works on the warm-up. 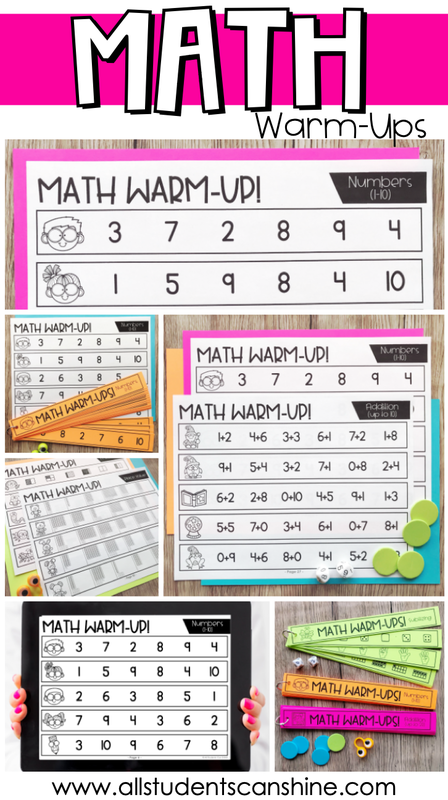 Record your students’ score and send it home. I really hope that you love this resource as much as I do! My copy is ready to go and I can't wait for my students to get their hands on their warm-up pages! While you're at it, join our Facebook Community to share and collaborate with dedicated teachers just like you!